The 2006 World Championships took place just a week ago, but the Division I Finalist CDs are already produced and scheduled to ship today. 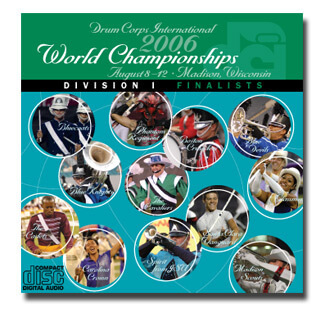 The $19, two-disc CD set includes the performances of the 2006 Division I Finalists: The Cavaliers, Phantom Regiment, Blue Devils, Bluecoats, The Cadets, Santa Clara Vanguard, Blue Knights, Carolina Crown, Madison Scouts, Boston Crusaders, Glassmen and Spirit from JSU. Learn more about this product and order your copy today.